Elizabeth Wyatt Sewing Patterns: I Can Sew - and you can too! 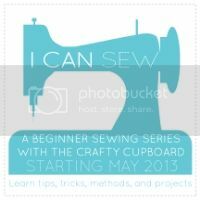 I Can Sew - and you can too! Melanie over at The Crafty Cupboard is just starting her "I Can Sew" series for sewing newbies (even you seasoned stitchers may find some helpful hints along the way). Click on the button below to check it out.